Nestle USA Headquarters monumental stair is a very complex small project. This project located in Arlington, VA 22209 contains a very challenging compound curve shape (oval staircase) with lighted plate railings covering the entire stair frame. The unique nature of the inner guarding on the stair, as it slopes to the vertical as well as being curved in plan to follow the helical shape was an initial challenge. The painted 14GA carbon steel cladding ribbed with 3/16” thick laser cut steel cladding and rail support paired with illuminated handrails and stair underside cladding that follows the bottom slope of the stringer even makes it more interesting if not daunting. By using Tekla Structures, the detailer was able to provide full shop drawings and machine data to the workshop, to provide, all stringers, treads, Glass and SS guarding, cladding, grab rails & brackets. 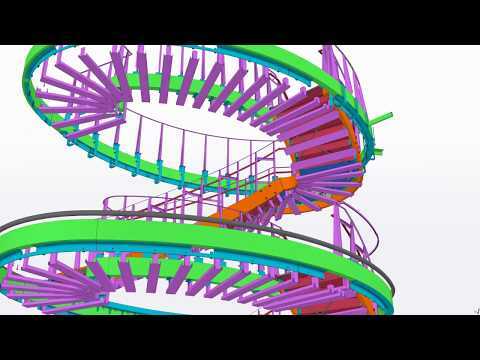 The experience we had on this project and in using Tekla version 21.1 in modeling them gave us enough experience and knowledge that when Tekla launched version 2017 where they introduce both the spiral beam and spiral stairs we knew what to expect. As soon as we found out that they are available, we eagerly tested the functionality and gave Tekla our feedback on what we have noticed and what we feel should be added. This is how we worked with Tekla as a business partner, there is an open communication.